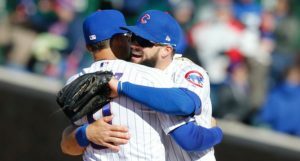 I think the washed out Angels’ finale on Sunday was a good thing for the Cubs – who were able to skip an only semi-planned Tyler Chatwood start – but I can’t say I wasn’t the tiniest bit bummed that it got banged. And not just for the lack of baseball on Sunday. 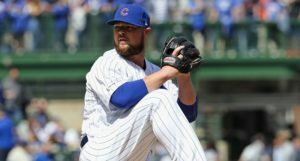 With Mike Montgomery and Jon Lester both on the IL at the same time, this was going to be a rare opportunity for Chatwood to take the mound as a starter again, and I just wanted to see what he could do. What can I say, I was curious. No, he hasn’t fixed his command issues, but he does look a bit better to me and a Trout-less, Ohtani-less, Upton-less Angels’ lineup at Wrigley wasn’t the most intimidating thing in the world. 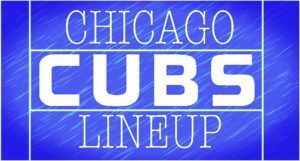 Alas, with no game yesterday, an off-day on Thursday the 18th and again on Monday the 22nd, the Cubs won’t need a fifth starter for a while and by the time they do, Montgomery should be back in the fold and Lester could be, as well. Maybe it’s for the best, but like I said … I was curious. Club option 2026 for $7,000,000 or $4,000,000 buyout. At ESPN, Jeff Passan contextualizes this agreement by explaining the wide gap between the motivations of individual players – especially guys like Albies, who hasn’t yet earned much in his career – against the cold, calculating front-office executives of today’s game. Could Albies have gotten more in arbitration, alone, not even counting the free agency he gave up? Yes. Would doing so help raise the earning potential of his teammates? Yes. Do those things outweigh the personal security of guaranteeing yourself $35M? I mean … that depends. I think he was likely to earn more than that almost no matter what, but when someone dangles that kind of money in front of you … we’re still all human. By contrast, front offices are effectively not “human”. They work collectively as a unit, using computers and algorithms to assign value, and then spit out that value onto paper for players to sign. That’s where we are. But just because we can explain the inner-workings doesn’t mean we have to like it, with some around baseball calling the deal the worst ever. And it certainly doesn’t mean we’re going to stop seeing headlines like this anytime soon: “Ozzie Albies Just Signed a Stinker.” At that link, Dan Szymborski uses ZiPS to project out Albies’ career and if it goes the way ZiPS thinks this might actually be remembered as the worst contract (from a player’s perspective) … ever. Yup. It isn’t just a subjected take. Here’s a taste: “[E]ven in the case that ZiPS is horribly overrating Albies, he’s still likely to be underpaid by at least $100 million for his contributions to the Braves.” Yikes. Baseball was already undergoing a bit of an issue with too many walks, strikeouts, homers, and hit-by-pitches, but that problem is actually getting worse, if you can believe it. Even though we’re still in the early, cold months of the season when offense is supposed to be down, those four outcomes (Ks, BBs, HRs, HBPs) have accounted for 37% of all plate appearances this season. Last season, when it was a problem, they accounted for a record-setting 34%. AND THAT’S INCLUDING THE SUMMER MONTHS. Whether you like it or not, the league will have to respond to this. It’s not good for the sport as a whole to have the ball in play so infrequently. Perhaps not unrelatedly, Ben Clemens has discovered that pitchers are throwing fastballs faster than ever *and* throwing fastballs less frequently than ever. It’s an extremely striking trend in graph form and pretty much uniform across the league for both relievers and starters over the last ten years. 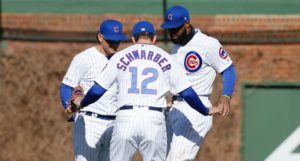 The Cubs don’t play the Brewers again until the middle of May, so Jeffress should be ready to go fully by then, all things equal. Speaking of the Brewers, they just made a minor trade with the Mariners, acquiring catcher David Freitas in exchange for right-handed minor-league pitcher Sal Biasi. Freitas, 30, can’t do much with the stick, but has shown promising defense behind the plate and has been a positive pitch-framer. Milwaukee already has Yasmani Grandal and Manny Pina behind the plate, though, so I doubt this is anything more than an extreme depth move. Still good to have pitch-framers throughout the organization, though. They can impart their wisdom on the other catchers and create a culture that permeates up into the big leagues. Er herm. Will the Padres really keep the checkbooks open? Possibly. They’ve gotten off to such a good start (11-6) and may have a rare chance to dethrone the Dodgers. Now could be the time. With that said, the Padres rotation has been the best in the NL (by fWAR) and fourth best overall in baseball this season. I doubt it stays that way (go ahead … name two Padre starters! ), but it certainly weakens the urgency. Relatedly, Craig Kimbrel’s asking price is extremely reasonable. MLB.com takes a look at the highest profile players who switched teams this year and how they’ve been doing so far in their new city. For Brad Brach and the Cubs, the 10 walks in his first 6.2 IP wasn’t great. And also out of Minnesota, did you see that ridiculous catch Byron Buxton made? He’s going to win another Gold Glove award (or three) before it’s all said and done.